I was all set to do my wild about plums post. I really am wild about them. I can eat them straight off the tree until I give myself a stomach ache. Unfortunately, I don't have much to show for it. For whatever reason, I've really struck out with wild plums this year. Maybe it's because I've been looking forward to them so much. Two years ago, despite getting chased off by rangers (I was picking legally, but I don't argue with enforcement), I picked enough plums to make a fantastic batch of jam. Ok, I know that I've complained that I'm not much of a fan of jam. But this particular plum jam came out such a stunning shade of blush pink that I was proud to have it lining my pantry shelves. And my dear friend declared it her absolute favorite (which is pretty much all you need to say to me to ensure that you will be supplied with jam for life). 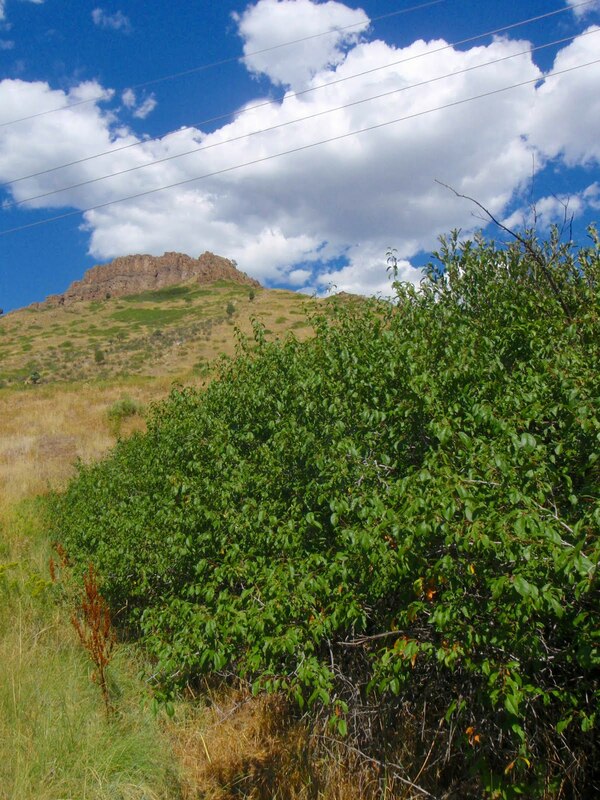 Then last year, while riding my bike along a trail which leads up into the mountains, I came upon a fantastic cache of wild plum trees. I wasn't prepared at the time, but I could have picked gallons upon gallons of pinkie plums, sweet as a dream. I vowed to come back. So, as you can imagine, all this summer, I dreamed about biking to pick those plums, my treasure. I wondered when was the right time to return. I waited, I anticipated, I checked the date of the pictures from last year. At last, the day arrived, and I strapped so many panniers and bags and bungees onto Odie that I looked like I was going on a cross-country trek, and headed up the hill to pick my load of plums. I was alone, but since it's a steep uphill bike ride to get there, I figured I could carry at least 50-60 pounds on my bike on the return trip, and practically sail down the hill. Can you guess where I'm going with this story? Yeah, you got it. No plums. Those darned trees were loaded, loaded I tell ya, last year. But this year, I could hardly find a plum to photograph (I had to scramble up a hill, and take a few twigs to the backside, just to get a picture of a few lousy bug-eaten plums, sniff!). I should have known better. I'm well aware that my own trees fruit every other year. I had wanted to close with some tidbit of wisdom about the mercurial nature of foraging. But instead, I'd like to propose a theory. Perhaps I cursed myself by taking all of my bags, by being prepared. Sort of like how it always rains after you wash your car. You will only find endless rows of ripe fruit when you have no bags in which to stash it. Hmmm. I think I'm onto something. Now you have me wanting to make plum jam-I remember sometime in Normandy at a farm house where the husband was so proud of his plum jam he brought them all out for me at breakfast. I found the same was true here. Last year I made a delicious plum/port/cinnamon jam from the little cherry plums from the flowering plum trees that line the neighborhood. This year not enough to even bother with, unfortunately! Love your blog principals, I will visit often. Thanks. Hey, thanks for visiting my blog. Plum jam sounds heavenly! How sad. Next year you can load up and give us a ton of plum recipes!! I don't eat them too often, I don't think I've ever cooked with them! I'm so sorry about your plum escapade! You'll have to keep us posted next year, same time, on what happens! I just bought a huge bag of plums from the farmer's market and I'm quite excited! You may be onto something with your theory! At least the ride wasn't wasted - great exercise and beautiful scenery! I don't think I've ever had a wild plum. 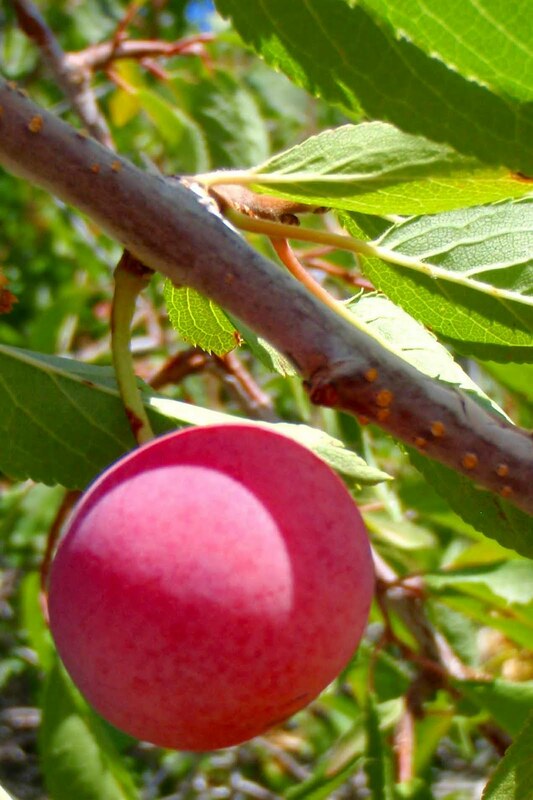 Wild plums are so delicious, with just the right balance of sweet and tart. Who knows, maybe I'll happen upon another plum tree sometime soon, and that one will have ripe fruit. I used to be a ranger at a coastal refuge where we had loads of beach plums. They can be really fickle. A too wet spring will do them in. In the four years I worked there, only one season was truly a banner year for plums. Funnily enough, the best bush was one that was right outside our visitor center in our native garden. Sweetest plums I have ever tasted. They are a favorite of wildlife as well, so there's a chance that any good ones that existed were gobbled up quick. Kate - What species are beach plums? 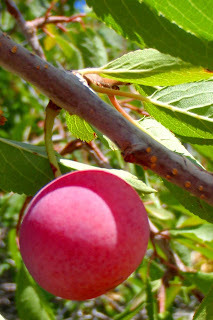 The plums in my area are prunus americana.